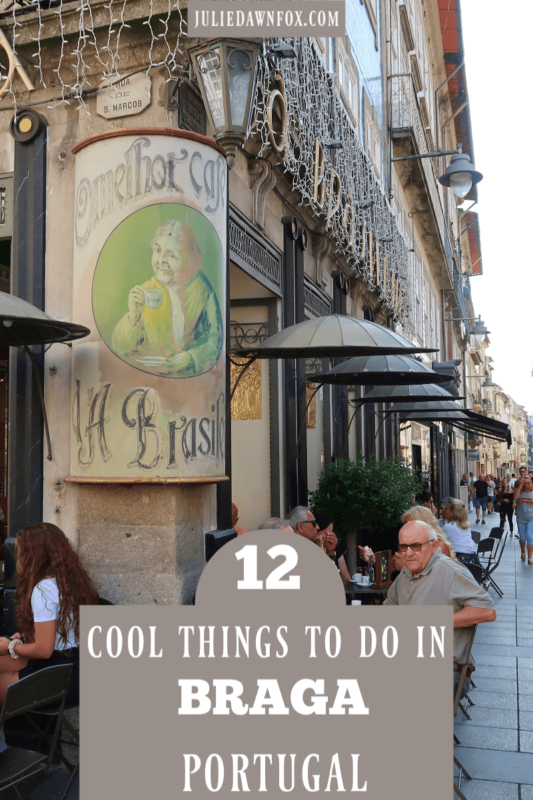 With so many fun things to do in Braga, it’s well worth incorporating into your Northern Portugal itinerary. The former Roman city of Bracara Augusta is now the capital of Northern Portugal’s Minho region and is well and truly steeped in history and architectural treasures. 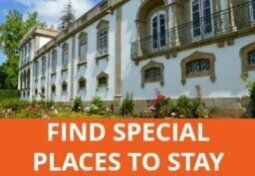 Try to allocate at least a day to visit Braga – better still, spend a few nights and use it as a base from which to explore the surrounding area. If you’re pushed for time, there are day trips from Porto that take you to see the highlights of both Braga and Guimarães in one day, like this one. 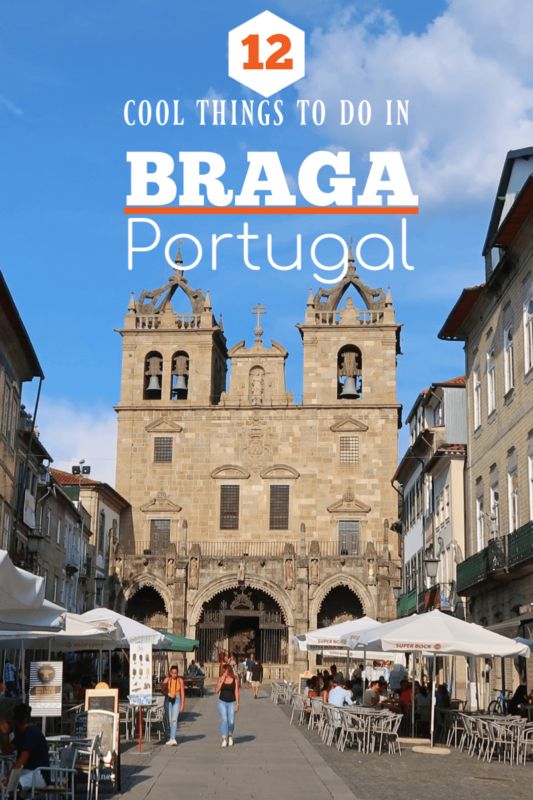 Find out what to do in Braga plus suggestions for where to stay in this guide. The oldest in Portugal, Braga Cathedral is a real mish-mash of architectural styles including Romanesque, Gothic, Manueline and Baroque. It’s well worth visiting although the organisation could learn a thing or two from other such institutions when it comes to providing information – unlike other cathedrals I have visited, there is no audio guide to explain the features within the main church and it’s not entirely obvious where you should go to buy tickets or how to enter the cathedral. Tip: Insist on purchasing the full visit ticket, which includes not only the cathedral but also side chapels that are kept under lock and key, the upper choir and the museum. The woman who served us seemed to only want to sell the €2 ticket for the main church. The full visit is €5. Since we had purchased the full route, the staff rustled up an English-speaking volunteer who used a set of enormous and ancient keys to unlock the gates to various side chapels. One contains the mummified body of Dom Lourenço Vicente who lost his eye in the Battle of Aljubarrota in 1385. The Chapel of Glory is decorated with 14th century geometric Islamic patterns and hosts the tomb of Archbishop Geraldo. Another highlight of the visit is the Upper Choir, a masterpiece of Baroque design with beautifully carved seats and fascinating views of the 2 gigantic organs. Braga cathedral is open for visits every day (in theory, barring services and events*) from 09:30 to 12:30 and 14:30 to 17:30 (18:30 in summer months). *Note: We had intended to visit on a Saturday afternoon but luckily, we popped in to make enquiries in the morning and learned that it would be closed for back to back wedding ceremonies all afternoon so we decided to rearrange our schedule and do the visit there and then. The Biscainhos museum is inside a palace which shares a name with the street it’s on. The Biscainhos were the Basque stonemasons who were brought to Braga to work on the new Gothic tower of the nearby cathedral in the 16th century. Since they all lived on the same street, it became known as Rua dos Biscainhos. The palace was originally built in the 16th century but many of the architectural and decorative features were added in the 18th century by the family who were keen to display the wealth they had accumulated from coffee and tobacco plantations in Brazil. They even had one of the uncles, a Jesuit priest, incorporated into the decorative oil painting on the ceiling of the Sala Nobre (Noble Room). Visits to the Museu dos Biscainhos are guided, although there is extra printed information about the furniture and features at the entrance to each room. The guide certainly helped me get a better appreciation of the lifestyle of the palace’s inhabitants. When I commented on the tiny beds in the master’s bedroom, he explained that because the noblemen used to gorge themselves on rich food in the evenings, they had to sleep upright, supported by cushions so long beds weren’t necessary! The rooms are filled with furniture which matches both the period in which each one was decorated and the intended use of the space, enabling me to imagine small groups of ladies and gentlemen playing cards at small tables and the nobles being served at the dinner table. After touring the house and the cloisters, we headed to the kitchens, which are separate from the main house. This was a sensible safety precaution since its fires burned constantly and could easily have set fire to the palace. I loved the house but was equally impressed with the well-tended gardens. The terracing allows each of the three different gardens to be seen when you enter through the grand gateway, a popular feature in Baroque gardens of that period. 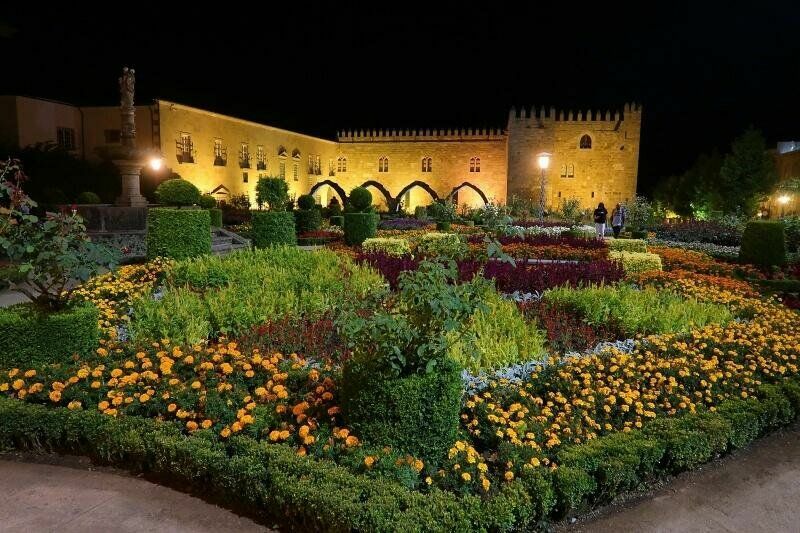 The first section is carefully manicured formal gardens with flower beds, fountains and sculptures separated by hedges and tiled walls. A fabulous circular viewing room is built into one of the walls and decorated with blue and yellow azulejos. The middle space is devoted to lawns and fruit trees while the last area is a vegetable garden. Biscainhos Museum is open Tuesday to Sunday from 10:00 to 12:15 and 2 to 5.30 pm except for major public holidays. An ingenious architect has made excellent use of the 14th century medieval tower, turning it into a small but interesting museum over several floors. The photography exhibits change periodically so even if you’ve been before, it merits a revisit if you’re in the area. Campo das Hortas 35-37 and open Tuesday to Friday from 11 am to 6:30 pm and Saturday to Sunday from 2.30 to 6 pm. It comes as no surprise that these gorgeous gardens are one of Braga’s most popular sights. Not only do the flowerbeds contain a riot of colour, the backdrop is an ancient stone palace, once home to the Archbishop. A beautiful respite from the hustle and bustle in the daytime, with the orange glow of streetlights, Santa Barbara Garden is a romantic spot at night, too. As city centres go, Braga’s is spacious and attractive with swathes of flowers adding colour to streets like Avenida da Liberdade. One of the most interesting shopping streets is Rua do Souto, which morphs into Rua Dom Diogo da Sousa after Largo do Paço and ends at the triumphal archway known as Arco da Porto Nova. There are lots of intriguing independent shops to explore on this main thoroughfare and the surrounding side streets. You’ll notice some fairly unusual sculptures as you wander around, too. 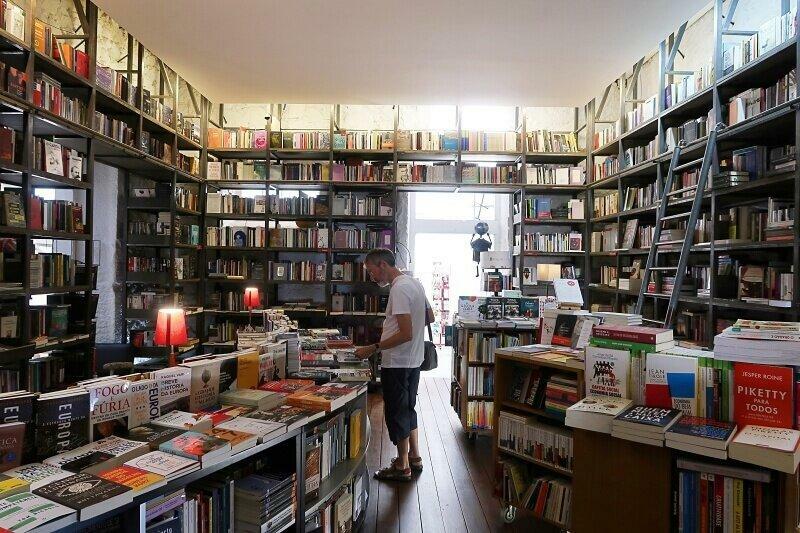 Centésima Página is a delightful bookshop housed in Casa Rolão, an 18th century Baroque style house on Avenida Central. It sells a wide selection of books, including some English language volumes and good quality gift and souvenir items. At the back of the bookstore, you’ll find a café with indoor and garden seating. Various attempts have been made to turn the upper floors of Casa Rolão into some kind of concept store but last time I visited, that seemed to be dying a death. This is my most recent gem of a discovery in Braga city centre. You could easily walk straight past the relatively unassuming facade without ever knowing what treasures lie inside. I urge you not to. The building was the former residence of António Augusto Nogueira da Silva, the man responsible for creating Casa da Sorte, the Portuguese lottery, in 1933. Inside, you’ll find relatively rare modernist interior architecture and incredible collections of ceramics, furniture, ornaments and paintings, all explained via audio guide. The best part, however, is the gardens. Here you’ll find some wonderful tile panels and lots of statues dotted amongst the rose gardens and fountains. It’s a gorgeous place in which to escape from the city for a while, especially if the tea garden happens to be open. Avenida Central 61, Braga. Open Tuesday to Friday from 9 am to 6 pm. Even if you don’t go inside, you’ll be impressed by the blue tile work and late Baroque/Rococco exterior of this mid-18th century palace. Inside, there are hand painted tile panels lining the staircase and walls as well as intricately decorated ceilings, although photography is not permitted inside the building. The rooms contain exhibitions relating to the hospital that used to be here and works by the Holy House of Mercy. Rua do Raio. Open Tuesday to Saturday 10 am to 1 pm and 2:30 to 6:30 pm. 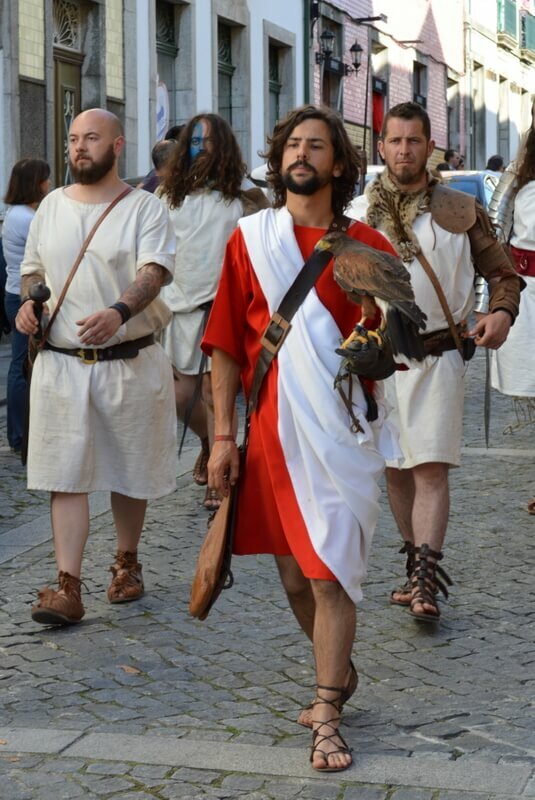 Every May, Braga pays homage to when Bracara Augusta was one the Roman Empire’s key cities. During the 6-day festival, the city centre streets and squares are filled with stalls selling all manner of produce, crafts, beverages and food. Each main square has a programme of entertainment with concerts, theatrical productions and games, all free to watch. Costumed professionals roam the streets to add to the festive atmosphere and join forces for a massive parade down one of the major shopping streets. There are also guided visits to the various sites of Roman heritage dotted around the city. 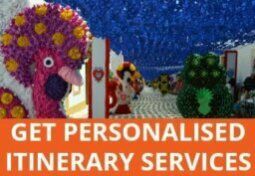 Check the website for the current programme. This is one archaeology museum I have yet to get to but is definitely on my list for my next Braga visit. As well as spoils from all over Northern Portugal, there are numerous models to help you to visualise what life was like back in the 1st and 2nd centuries AD. The archaeological exhibits date back to Paleolithic times and cover the period from then until the Middle Ages. Rua dos Bombeiros Voluntários. Open Tuesday to Sunday from 10 am to 5:30 pm except major public holidays. 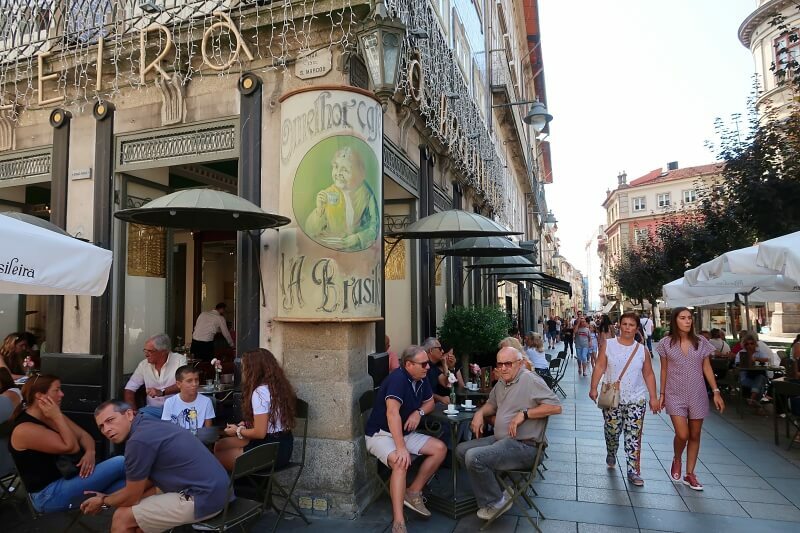 This sister café to the original Café A Brasileira in Lisbon has been a popular spot for Braga locals since it opened as a coffee shop in 1907. The original owner would offer a free cup of coffee to clients who purchased a kilo of coffee. Largo Barão de São Martinho, Braga. The hilltop sanctuary of Bom Jesus is just outside the city centre so you’ll need some form of transport to get there (see this post for full details). What you’ll find is a monumental staircase leading up to the church, which is surrounded by forest, ponds and grottoes. The views from up here are quite spectacular and its a popular weekend picnic spot. 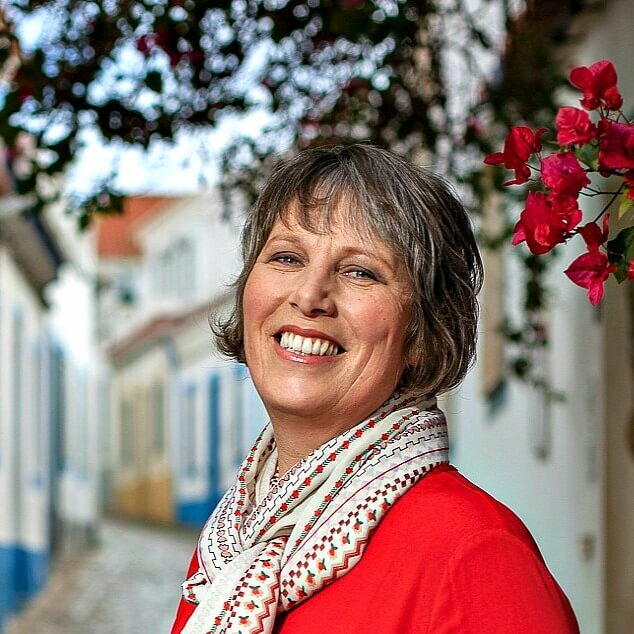 You can be picked up from Porto, Guimarães or Braga city for this full day historical tour with lunch and transport, which includes visits to Bom Jesus and the amazing Tibães Monastery. Alternatively, if you only want to allocate half a day for Braga sightseeing, try this half day tour from Porto. Note: If you are travelling straight to Braga from Porto airport, you can book a private transfer online. If you have the luxury of spending a night or more, there are plenty of places to stay in Braga. Disclosure: This article contains affiliate links to my partners for tours and accommodations. This means that at no extra cost to you, I may be compensated if you purchase using those links. Hi Julie! I was in Portugal in 2014. My husband & I went to Lisbon, Sintra, Evora, Coimbra, Fatima & Porto . From Porto, we went to Bom Jesus and we loved the place. There is another church in Lamego that is similar to Bom Jesus. We wanted to visit but i couldn’t get hold of any information on public transport from Porto. Could you give me info on that ? Thanks. Hey Julie, We have been checking out your blog and we must say that we are very impressed. It’s really great. We have particularly been following your posts about Braga as we visited there too. 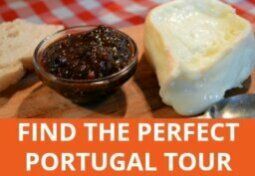 We have even written a guide, which you can check out here: http://hitchhikershandbook.com/country-guides/portugal/braga/. We would love your feedback and any tips, information, advice that you might have would be warmly appreciated. Acho que posso escrever em português . Estou bem ligada a Braga embora viva no Porto. Temos casa a 5 Km de Braga e passamos lá o Natal (família grande!) A Páscoa, fins de semana e alguns dias no verão. O Museu da SÉ foi remodelado e visitámo-lo em Novembro passado. Há ainda o Bom Jesus para visitar que é muito agradável. Para comer recomendo Os Silvas que têm um estabelecimento perto do café A Basileira, digno também de uma visita – foi remodelado recentemente. Os Silvas têm outro estabelecimento mais abaixo,no shopping de S. Lázaro, junto ao velho hospital e da Casa do Raio (digna de se ver, infelizmente só por fora), perto da Fonte do ídolo, já rfeerida num comentário anterior. Junto do café Brasileira há a Casa dos Crivos, pertencente ao Municipio e que tem exposições temporárias. Ainda me lembro de muitas casa como aquelas que desapareceram completamente de Braga. Fico por aqui, mas há muito mais a ver. E Guimarães? EStá linda! AS duas cidades são “rivais” o que acho um grande disparate! Seja sempre benvinda ao Norte. Já conheçe os espigueiro do Soejo?? únicos! Um abraço e bem-haja pela divulgação. Atualmento o meu ramo é mais a divulgação dos bordados portugueses e de certo modo a sua revitalização! Thanks for all your tips and recommendations. I will definitely check out the restaurant you mentioned, as well as the Casa dos Crivos. I think Braga is a lovely city and well worth revisiting. I’ve spent more time in Guimarães so far and I’m equally impressed with it, although they are totally different cities. Hi Julie Sorry I haven’t yet time enough to read all your blog! Se ou quando voltar ao norte a Braga terei muito prazer em a receber, minha mãe nasceu em Braga e, por mera coincidência, meu marido também. Vivemos no Porto há muitos anos. Hi Pedro, Thanks for stopping by. It’s nice to *meet* another blogger, especially one from the area I’ve just written about! I really appreciate your tips. I’ve saved them for future reference for next time I’m up north. Happy blogging! Last time I was in Braga (June 2013) I also met the very stern-faced man… I was in shock, actually, as I had been there before and taken photos without any problem. I’m not sure if you know, but the cathedral was built on what used to be a temple to Isis and, before the construction of Santiago de Compostela, the Braga cathedral was the most important religious building of the Iberian Peninsula. Also, as a side note: when visiting the Bom Jesus try to go there on a weekday if you can. Weekends, Sundays in particular, are when all the locals seem to flock there for a bit of green and fresh air. So weekdays are a lot more ‘peaceful’. At least he’s consistent! I was quite shocked, too. And disappointed as there are so many wonderful architectural features I’d have loved to photograph. I didn’t know that about the cathedral’s history or regional significance so thanks for sharing, and for the tip about visiting Bom Jesus. I think we went at the weekend and it was teeming with families having picnics in the woods. And who can blame them? It’s a lovely spot. I’ll echo Sami’s recommendation. We enjoyed Bom Jesus do Monte so much, and the views are incredible. Thanks for the tips on other things to see in Braga. Like you, we only had a short time and we couldn’t see as much as we’d have liked to. I agree, Linda. The views are spectacular – I love your photos, by the way! Merry Christmas to you! Out with friends? However you celebrate, enjoy, and very best wishes for 2014. Merry Christmas to you, too Jo! Braga is a beautiful city Julie. Next time visit the “Bom Jesus de Braga” a beautiful church and marvellous gardens on top of a hill with views over the city. Hi Sami. Thanks for the tip. I visited the sanctuary and gardens a couple of years ago and you’re right, they’re well worth going to.